Safari binoculars are one of the most important items to take with you on your African safari because they enlarge the wildlife you are viewing and make them appear brighter in low light conditions. Here's how to make sure you choose the best one to take with you. Please note that most safari companies do supply one pair of binoculars to the group but they are often of low quality and a little battered from regular use and you will have to share them. Missing something exciting like a cheetah running after an impala because someone else has the binoculars can be frustrating as can having to pass them to your travel mates when you actually still want to watch that magnificent male lion disappearing into the distance. When choosing binoculars it's best to determine what they are primarily going to be used for because the characteristics necessary will differ for each use. So what are the essential characteristics that a binocular for safari use needs? It needs to have a high power of magnification to be able to see the spots on a leopard but not too high because there is no place for a tripod in a safari vehicle and a handheld binocular with a very high magnification power is difficult to keep still. It needs to be light and compact because you will be packing a lot of other things for your safari and there are weight limitation considerations. The roads in Africa can get rough and might cause you to drop your safari binoculars so they need to be tough to withstand accidental bumps and bashes. The field of view needs to be as wide as possible because you will be doing a lot of scanning in areas enclosed by undergrowth, bushes and trees and the wider field of view will help you spot the animals quickly in these conditions. As this may be the first time you are going to be seeing some of these wild animals you need to be able to see them very clearly and therefore need the best quality prisms and optical coatings to cut down on light reflection. Eye relief is important because you will probably be spending a lot of time on your safari looking through your binoculars so it has to be comfortable especially if you wear spectacles or sunglasses. It mustn't cost the earth because a safari is often a once in a lifetime experience and even though you might use it on occasion back home it wont justify spending the thousands which some of the best ones cost. Field of View: At least 330 ft at 1000 yards. Weight: Not more than 30.1 oz. lbs. While choosing your safari binoculars you might still be deciding who to use to organise your safari trip to Africa. Thi list ranks the Top Three Safari operators in Kenya, Tanzania, South Africa, Botswana, Namibia and Zambia as decided by the trip reports of previous safari travellers. 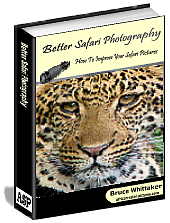 A free 41 page e-book which will help improve your safari photography attempts called "Better Safari Photography". A checklist that details exactly what you need to pack for your safari. Valuable safari tips that you need to know before you go. A comprehensive wildlife ticklist containing many of the animals you will see in Africa.